DAC - Solid Aluminum Cabinet Feet 50mm OD x 19mm H - Black Overview: A Hi-End AMP needs a go..
DAC - Solid Aluminum Cabinet Feet 50mm OD x 19mm H - Silver Overview: A Hi-End AMP needs a g..
Penn-Elcom F1686 Rubber Cabinet Foot 1" Dia. x 0.375" H Overview: This heavy-duty ru..
Rubber Cabinet Foot 25mm Dia Dia. 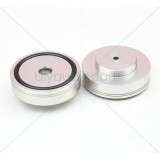 : 25mm Height : 10 mm ..
Rubber Cabinet Foot 32mm Dia Dia. : 32 mm Height : 10 mm ..